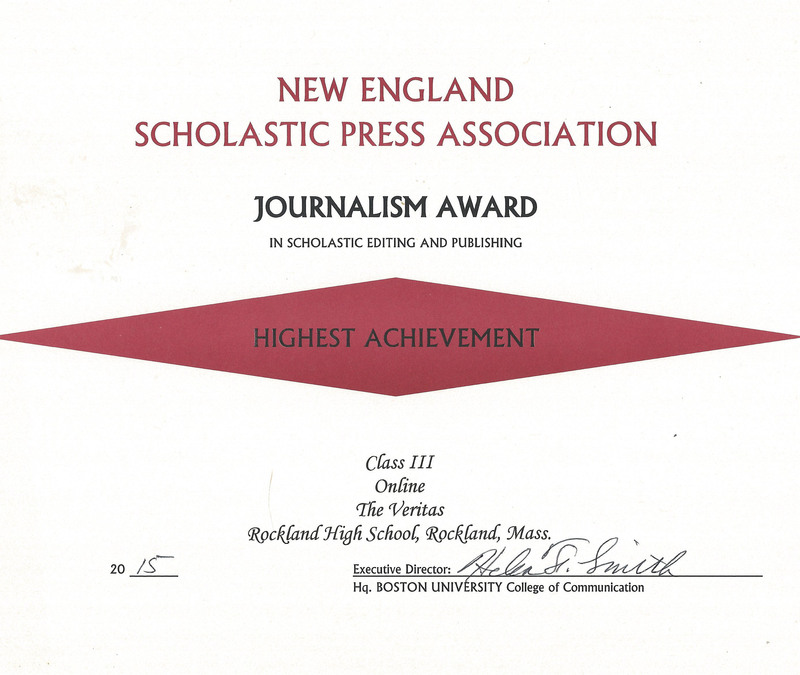 The print and on-line editions of Rockland High School’s student newspaper, The Veritas, recently received Highest Achievement Awards from the New England Scholastic Press Association (NESPA). This organization sponsors a high school newspaper contest each year and invites submissions from hundreds of schools in New England to be judged in the category of Scholastic Editing and Publishing. The Veritas has received a Highest Achievement Award for several years in a row, but this year student editors and reporters in the Journalism class took it one step further. In division three, based on enrollment, The Veritas was judged best in New England. 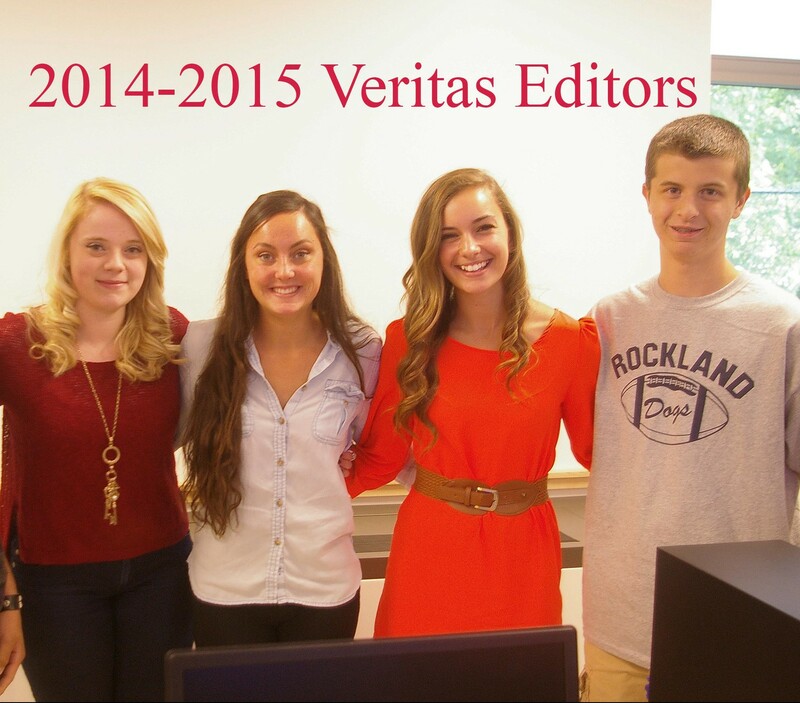 The Veritas shared its first place award with another high school newspaper, the Veritas from Nantucket High School. 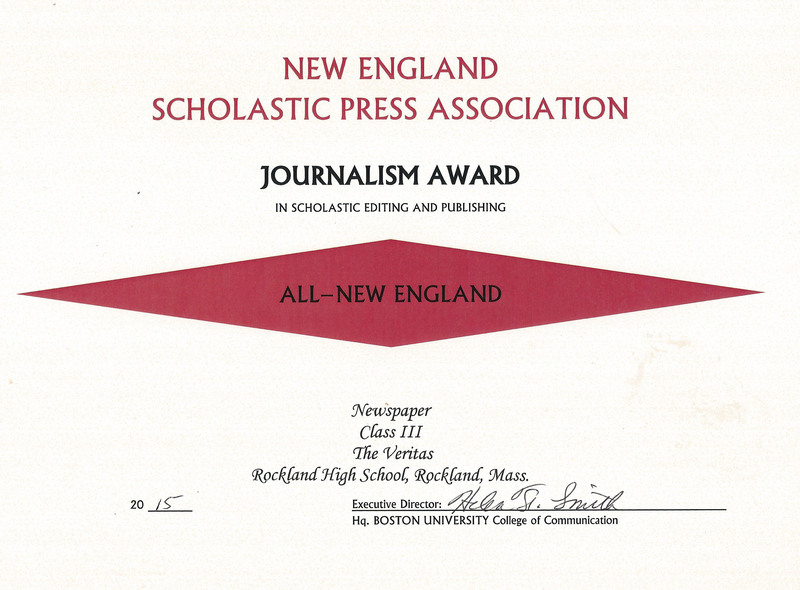 The All-New England Award is the first Rockland High School’s newspaper has received since 2010. Journalism adviser, Mrs. Lannin-Cotton says this award represents not only the talent, but also the hard work of the students in Journalism this year. In particular, she credits the senior editors, Alex Pigeon, Katie Delorey, and Cam Stuart for their work in putting out the paper this year. She also says that seniors Brian Cohen, Mekenzie Levesque and Mike Leavitt also did a great job on their assignments and in their role as leaders of the staff. “The way that they covered, in particular, the tragic deaths of their classmates this year showed a professionalism that went beyond their own feelings,” said Mrs. Lannin-Cotton. Dr. Cron goes for a swim in the dunk tank! Zach Murphy enjoys some watermelon. The cook-out featured something for everyone! On Friday, May 22, the annual Senior Class cook-out was held. After a difficult year for Rockland High School, and especially the Class of 2015 this year’s Senior Week outing was a special one for students. Organized by Nancy Borden and with help from parent volunteers and local businesses and restaurants, this year’s cook-out was one of the biggest ones yet. Following a busy week of CPR training, a presentation from Harbor One, and discussions with Rockland police officers the seniors were ready to wrap up their week. The 99 Restaurant and Dominos Pizza reached out to Borden expressing interest in sponsoring the senior cook-out. Students were able to share a nice lunch with their peers, try their best at the dunk tank, and left with gift bags that included items such as: a drawstring backpack, a Dunkin Donuts gift card, a T.J. Maxx gift card, a water bottle, a movie pass, glasses, and a coupon for the local Lisa’s Hair Design. The Rockland community really came together once again to provide this for the seniors. Senior NHS Members: Back row from left to right: Alex Pigeon, Kara Penney, Julia Matson, Katie Delorey, Iman Bendarkawi, Allysa Collins, Natalie Ellard, Mekenzie Levesque, Taylor Reis, Samantha Poirier, Nicole Cook, Danielle Whitcher, and Tiffani Vo. Front: Andrew Frazer, Cameron Kelley, Justin Nguyen, Dylan Bernache, Dennis McPeck, Brian Cohen and PJ Butler. Ryan Quirk receives his brother Jared’s NHS senior certificate from RHS Principal, Dr. Cron. Social Studies teacher and soccer coach, Richard MacAllister thanks the NHS for his honorary induction into the Rockland High School Pentelic Chapter of the National Honor Society. Senior Mekenzie Levesque receives her NHS certificate from Principal Alan Cron. NHS President Danielle Whitcher (left) conducted the ceremony. Junior inductees to the NHS: Back row left to right: Celia Rosa, Kate Dorney, Sarah Margolis, Haley Macray, Ashley Pezzella, Meghan Foster, Lexie Carchedi, and Caroline Kilduff. Front row left to right: Matt Kirslis, Jared Ochenduszko, Tom Spengler, Kevin Levesque, Ryan Sugrue, and Mark Ewell. Seniors gather after the ceremony with Mr. Graziano and Ms. Walsh. Senior NHS member Dylan Bernache introduced Social Studies teacher and coach Richard MacAllister as an honorary inductee to the NHS. Senior Dennis McPeck and RHS Athletic Director Gary Graziano at the end of the ceremony. Dennis introduced Mr. Graziano as an honorary inductee of the NHS. Vice President Alex Pigeon exemplifies the torch, symbolic of the National Honor Society. On Wednesday, May 20, 15 students (14 Juniors and 1 Senior) were inducted into the Rockland High School Pentelic Chapter of the National Honor Society. Senior members Dennis McPeck and Dylan Bernache introduced RHS Athletics Director, Gary Graziano and RHS social studies teacher and soccer coach, Richard MacAllister as honorary inductees of the NHS. The ceremony was conducted by Danielle Whitcher, president of the Rockland High School Pentelic Chapter of the National Honor Society. Secretary, Katie DeLorey announced where the senior members would be attending college. Seniors Natalie Ellard, Alyssa Collins, Taylor Reis, and Samantha Poirier read the four virtues of NHS: character, scholarship, leadership, and service. Following the reading of the four virtues, Vice President, Alex Pigeon exemplified the torch, a symbol of NHS. Following the exemplification of the torch, the candidates for induction recited the NHS pledge and received their membership pins. Senior members received a yellow rose and their NHS certificate. Ryan Quirk accepted his brother, Jared Quirk’s certificate and rose on his behalf. 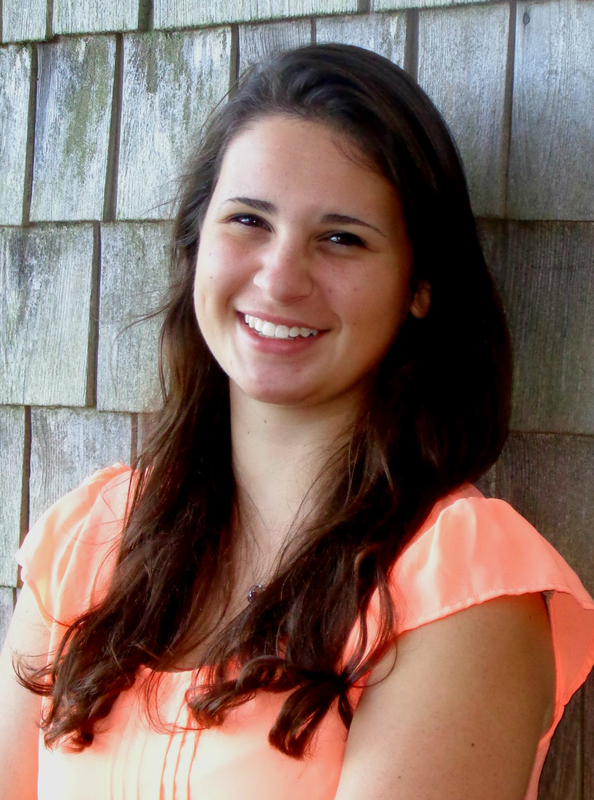 Senior Alyssa Collins has been named the Class of 2015 Valedictorian. She will receive her award at the Senior Banquet and Awards ceremony on Thursday night. Alyssa will also give the Valedictory Address at Graduation on Friday night. 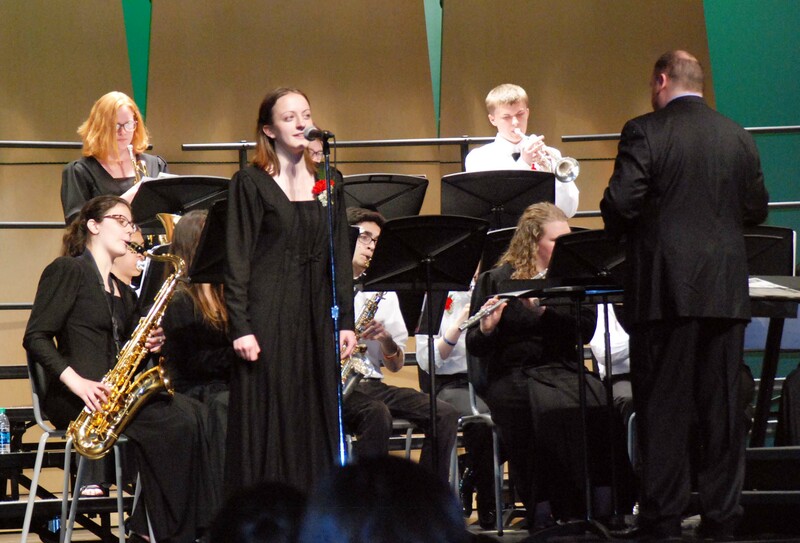 Collins has been active throughout her high school career in the Theater Guild and in the Music Department as a member of the Concert and Marching Band. She served as Drum Major of the Band this year. A member of the National Honor Society, Collins also was captain of the Math Team this year. Was this a goal of yours to be Valedictorian? It was. I started off freshman year at number four in the class and slowly worked my way up to the top with a lot of hard work and late night study sessions. Where are you going to school? Major? Next year, I will be attending Clark University to study cognitive psychology. I eventually want to conduct my own psychological research. I’ve always had a love for math. Most people hate it but I have typically been able to understand it and therefore don’t have such a deep seated hatred. I also took AP Psychology this year which I wish I could have taken earlier. I have planned for a long time to study psychology in college so I wish I could have had a longer chance to learn more about it in high school, but I really enjoyed the class.When I study psychology, I plan on conducting my research on how people comprehend numbers and calculations, so I will be combining two of my favorite subjects as a future career. What is the thing you’ll miss most about high school? I’m going to miss my music department family and the fact that the teachers are so personable. I’m really going to miss being able to have a repertoire of teachers and friends to go to if I have a problem or if I just want to talk. Although sometimes you hate that teachers assign too many homework problems and give you super hard tests, I appreciate that the faculty here really pushed us to be not only better students, but better people. What do you look forward to most in college? What do you do to have fun? Fav. movie, music? I love watching YouTube videos, listening to music, and snapchatting or hanging out with my best friends. Change is a necessary evil. As hard as it may be when it is happening, you can always look back on those moments and witness how much you’ve grown. 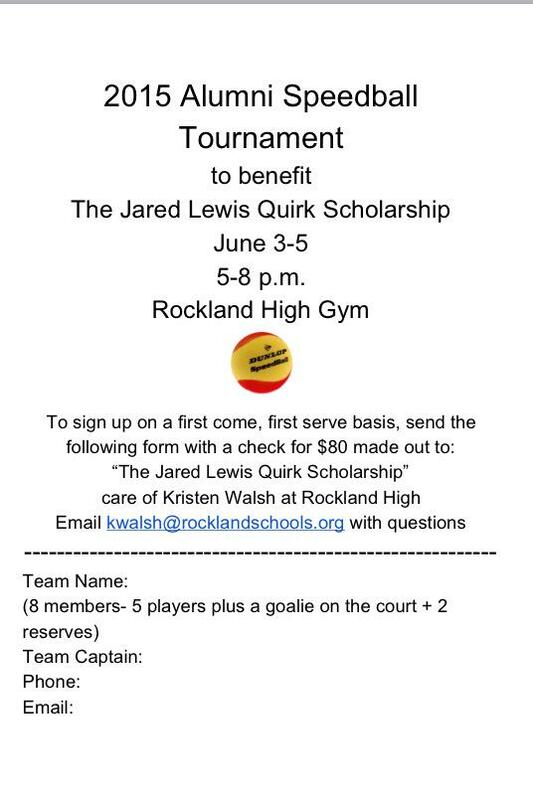 A Rockland High School alumni speedball tournament will be held from June 3 to June 5 to benefit the Jared Lewis Quirk scholarship. 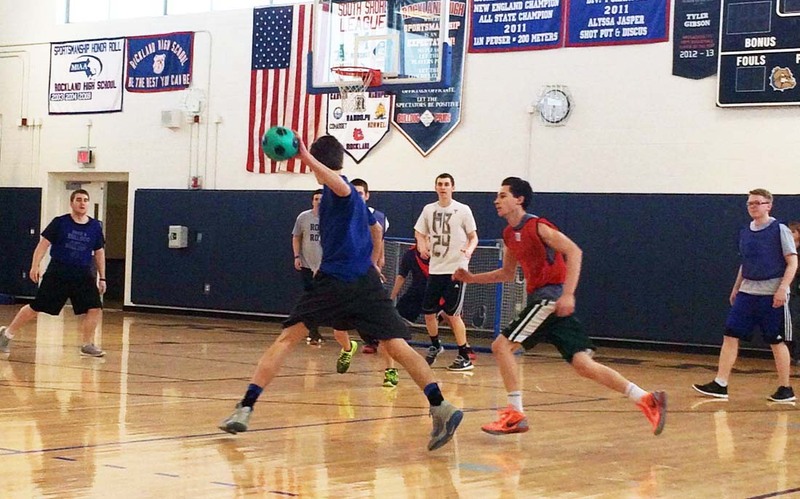 The tournament will be held for three days in the Rockland High School gym from 5-8 pm each night. To be a part of this tournament teams of eight (five players, a goalie, and two reserves) may sign up to compete by filling out the form below along with a check for $80 by Friday, May 22. The signing up process will take place on a first come first serve basis. Questions can be emailed to Kristen Walsh at kwalsh@rocklandschools.org. For more about RHS’s love for and involvement with speedball please click here to watch a video on the topic. 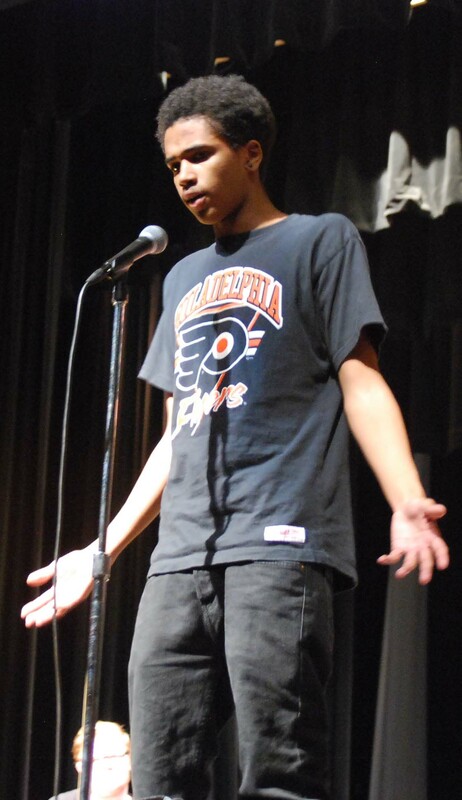 On Friday May 8, the Rockland High School English Department held a new event called Sophomore Story Slam Smackdown. Students, chosen by their classmates, told stories of their life experiences including the good, the bad, and the ugly. Thirteen students competed in total for the title of champion including Myles Fonfield, Nicole Martin, Evan Murphy, Derrick Trudeau, Corey MacDonald, Alisson Sammon, Mike Belmonte, Josiah Zaporetski, Andrew Starkey, Dana Peck, Jake Hughes, and Sophie McLellan. Everyone who competed showcased the talents of students in the Class of 2017. They also demonstrated courage in getting up on stage and performing in front of their peers. The winners received Visa gift cards ranging from 30 dollars for first prize and 10 dollars for the tied third place winners. First place went to Myles Fonfield for his moving story about his childhood growing up and listening to lessons of his parents. Second prize went to Corey MacDonald for his humorous story about a bloody nose and a long trip to the hospital. A tie for third place went to Evan Murphy for a story about flaming logs thrown by mothers, and Nicole Martin for her emotional back story on her adolescent struggles. Dana Peck tells her story during the Sophomore Story Slam. photo by Jurnee Dunn. Nicole Martin on stage at the Sophomore Story Slam photo by Jurnee Dunn. 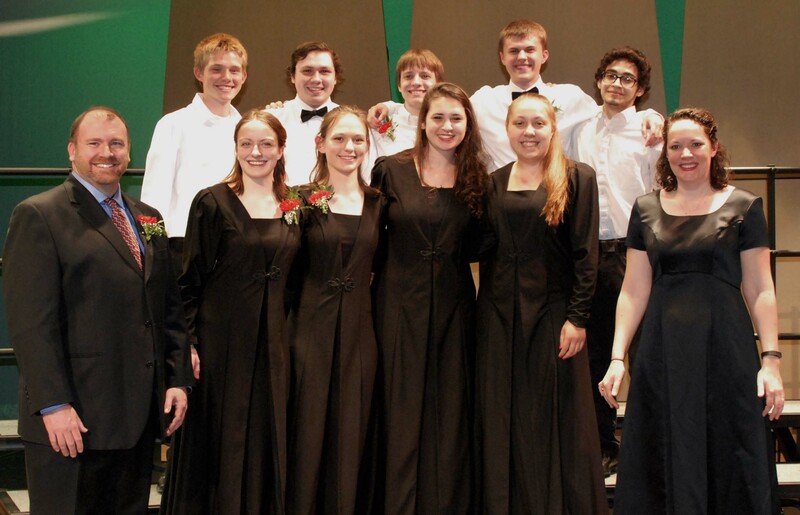 Seniors in band and chorus: Back row l to r: Ian Welch, Michael Bailey, PJ Butler, Markus Rohwetter, Dan Silva. Front row: Mr. Michael Coogan, Ella Engle, Kaitlyn Mott, Alyssa Collins, Samantha Poirier, and Mrs. Jennifer Hartnett. Rockland High School’s music students paid tribute to departing seniors and instructors in last night’s Pops Concert held in the auditorium. Senior Ella Engle sings “Blue Skies” with the Jazz Ensemble at the Pops Concert. Next, several RHS alumni joined the chorus and sang the traditional “Road Home” with Genesis Rojas as the soloist. Surprising their directors, Mr. Michael Coogan and Mrs. Jennifer Hartnett, the chorus sang “My Way” to them. It was an emotional finish to this end of the year performance.